I've signed up for ljbookbingo this year, mostly due to encouragement/nagging from clea2011, and pompom waving from fififolle. Last year I kept a book reading list, which I think I'll do again this year as well, simply because I'm also tracking all the magazines and journals I read, and I suspect I'll also be reading several books that won't fit the bingo card, so I need a separate list for completeness. Here's my bingo card. 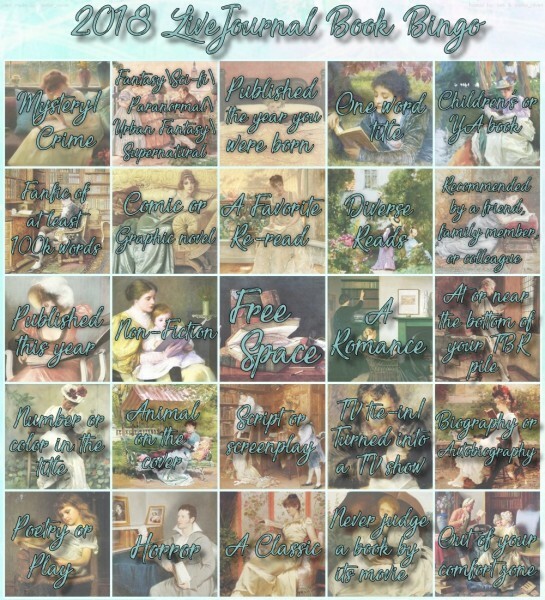 I have to admit, I've already spotted several squares that could be filled with books that are already on my to-read list, so that's a win before I've even started! Thank you so much for the head's up! I just signed up and I am really hopeful that it will keep me on point for my new year's resolution. I hope you don't mind but I copied your list. I love the card but the graphics made it very difficult to read and the list will help.